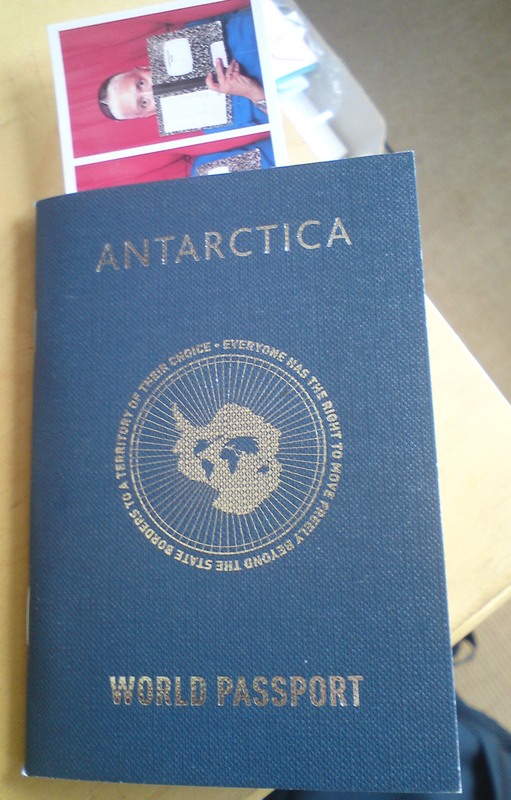 Here’s my new passport to the continent of Antarctica, a continent which, by the 1959 Antarctica treaty, is established as a common territory open to “all peaceful peoples and and to cultural and scientific cooperation”. It’s a lovely, well-made thing, one in a series of 30,000 created by artist duo Lucy + Jorge ORTA for the Festival of the World, one of the satellite events surrounding the London 2012 Olympics. It was easy to change citizenship: a quick visit to a photobooth (20p a go) and then to the nearby Antarctica desk where my name was written down. Whether or not it’s an ORTA internationalist response to the nationalism of the Olympics (I’d like to think so), it’s very much in keeping with the artists’ humane and social art, which has embraced suits of clothes that zip together, turn into tents and, as part of their latest Antarctica project, a flag of many flags, in which existing national flags are blurred into a coloured velocity of a single image. The flags fluttered over the buildings of the Southbank for the duration of Festival of the World. Going off at a tangent, I’m reminded too of Laibach’s Volk (Mute Records) from 2006, an album in which the Slovenian pranksters naughtily appropriated, cut-up, and generally doctored over a dozen national anthems from around the world. What the band calls “perfect pop” in the service and the interrogation of power. One could say that ORTA have employed perfect design to do much the same thing.